Chimpanzees are one of our closest relatives, sharing an estimated 98% of their genes with humans. Chimpanzees are a great ape along with gorillas, orangutans and bonobos. When they are ill, chimpanzees will eat medicinal plants to heal themselves. They inhabit tropical rain forest, and lowland and mountain forests in western and Central Africa. Nigeria-Cameroon chimpanzee (P. t. ellioti). The lifespan for chimpanzees is 40 to 50 years in the wild and for those in captivity it is 50 to 60 years. Chimpanzees are omnivores which mean that they eat both plants and animals. They like to eat fruit, insects, eggs and meat. The adult male chimpanzee weighs between 40 and 60 kg (88 and 132 lb), the female weighs 32 to 47 kg (71 to 104 lb). Head-body length (from the nose to the rump while on all fours) ranges from 63 to 94 cm (25 to 37 in). Males can measure up to 1.6 m (5 ft 3 in) tall while standing and females up to 1.3 m (4 ft 3 in) tall. The chimpanzee has a thickset body with long arms, short legs and no tail. Baby chimpanzee has white tail tuft that disappears in time. Chimpanzees thumb is in opposition with other fingers which means that their thumb is not in the same line with other four fingers (just like in human hands). Specific shape of hands allows them to develop and use tools, to groom each other. Although they normally walk on all fours (knuckle-walking), chimpanzees can stand and walk upright. By swinging from branch to branch they can also move quite efficiently in the trees. The chimpanzee is both arboreal and terrestrial, and spends its nights in the trees, while most daylight hours are spent on the ground. Chimpanzees are highly social animals. Their communities consist of loose and flexible groups of males and females within a fixed home range, led by a dominant male. Members join and leave these communities freely, depending among other on their reproductive status and the availability of resources. Chimpanzees use tools like sticks to extract ants from the trees/holes, or stones to break the shell of the nut. Chimpanzees have complex social relationships. Apart from the dominant leader, there are also groups of individuals with some level of authority. An entire chimp community can sometimes have as many as 100 members. Chimps use body language, facial expressions, hand-clapping, grooming, and kissing to communicate within their community. Usually a male chimp stays in the community into which he was born, but females transfer to other communities when they become adults. A chimpanzee’s senses of sight, taste, and hearing are similar to those of humans. Chimpanzees are omnivores. They rely heavily on a wide variety fruit and leaves, but also eat insects, bark, eggs, nuts, and even hunt monkeys and other small animals for meat. Chimpanzees can be infected with same diseases like humans: measles, ringworm, hepatitis B, influenza. Chimpanzees hunt together and share their spoils from the hunt as a group. 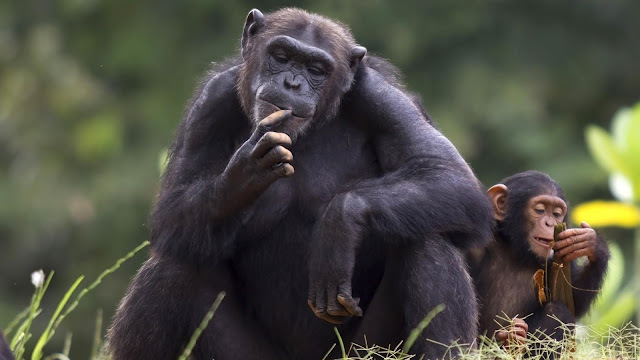 A chimpanzee is able to remember where it has hidden its food and where food was available the year before as well as when certain foods are ripe in different areas of the forest. Grooming is important ritual that creates close bonds between community members. It can also calm the nerves of excited animals. There is mounting evidence that chimpanzees are able to discern that specific plants help them with problems such as intestinal parasites and upset stomachs. Studies show that chimpanzees eat medicinal plants when they have problems such as these. Chimpanzees are one of the few animal species that employ tools. They shape and use sticks to retrieve insects from their nests or dig grubs out of logs. They also use stones to smash open tasty nuts and using wads of crumbled leaves to sponge drinking water from hard-to-reach places. They exchange kisses, hugs, touches in their community and use complicated system of sounds to communicate. When in captivity, a chimpanzee can learn many things, including human sign language. One chimp by the name of Washoe has learned approximately 350 hand signs for communicating with others. Some chimpanzees are slow while others are brilliant. The range of intelligence of chimpanzees varies, just as ours does. The complexity of their intellect is matched by their rich and complex emotional repertoire. They feel, and they express those feelings. They use feelings as yet another way to navigate through their lives and relationships. Their feelings range from anger to exhilaration, from humor to despondence – and every other emotion we know. Chimpanzees are 6-7 times stronger than humans. Breeding occurs throughout the year. Female chimps in the wild usually give birth for the first time when they are between 12 and 15 years old. Following a gestation period ranging from 202 and 261 days, females give birth to a single young, and occasionally twins, every 5-6 years. longer period, sometimes up to 10 years. When chimpanzees are bored, they organize various games to entertain themselves. The main predator, or natural enemy, of the chimpanzee is the leopard. However, a full-grown chimp is a very powerful animal, so leopards prefer to attack, kill and eat young or baby chimpanzees. Usually, young chimpanzees stay very close to adult chimpanzees however, so it is hard for a leopard to catch one. Chimps are most definitely endangered. At the beginning of the 20th century there were one to two million in the wild. Today, there are between 170,000 and 300,000 in the wild and they are disappearing at an alarming rate because of destruction of their forest habitat and the illegal commericial bushmeat trade. Because they are so smart, chimps have been involved in many scientific studies, and unfortunately some people keep them as pets. Chimpanzees are known for possessing great amount of muscle strength, especially in their arms. However, compared to humans the amount of strength reported in media and popular science is greatly exaggerated with numbers of four to eight times the muscle strength of a human. Chimpanzees in captivity can learn human sign language. The reason for the higher strength seen in chimpanzees compared to humans are thought to come from longer skeletal muscle fibers that can generate twice the work output over a wider range of motion compared to skeletal muscle fibers in humans. Chimpanzees’ body temperature is the same as humans, at 37 degrees celsius or 98.6 degrees fahrenheit. While humans have blood types A, B, O, and AB, chimps have only A or O. Although they use all four limbs for walking, chimpanzee can walk on two legs. Many older captive chimpanzees suffer from cardiac disease and take the same medications that humans take for heart conditions. Chimpanzees have 32 teeth same as humans. They spend night in nests in the tree. Nests are made of leaves and branches. Each night, chimpanzee changes location of his nest. Unlike most other animals, chimpanzees can recognize themselves in a mirror. Chimpanzees don’t like to be in water and usually can’t swim. Chimpanzees have been commonly stereotyped in popular culture, where they are most often cast in standardized roles as childlike companions, sidekicks or clowns. Female will give birth to a baby each 3-4 years. Bond between mother and young animals is very strong and it lasts over 7 years.